Microsoft has begun integrating Lync, its enterprise-focused communications service, with Skype according to multiple user reports that we’re seeing. Back in February, the Redmond company announced that the two services would be linked before June this year and — since we’re only in mid-April — it appears that things are running healthily ahead of schedule. However, there is still some way to go as both instant messages and voice communications will be passable through each service to the other, while video calling is expected to take up to 12 months (from the announcement) to connect between the two. 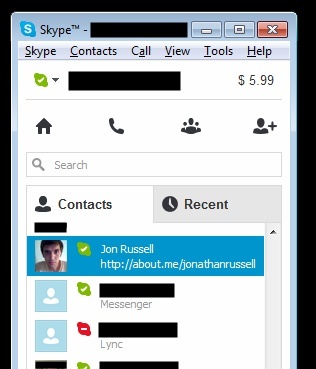 Here’s a screenshot from a TNW friend — who’d prefer not to be named — which shows that already contacts from Lync are beginning to appear on Skype contact lists. Looking at Twitter, others have also noticed and appear to confirm that the integration is based on Outlook contacts, which explains why our source did not get a prompt to add Lync contacts to their Skype account. skype to lync is awesome! Outlook contacts are automatically available as skype contacts if they have lync. Intercompany chats #FTW! Despite observations of this change, there has been no announcement from Microsoft, but we’ve reached out to the company to clarify. Last year, Microsoft announced plans to close down its hugely-popular but now dated MSN Messenger service, following which users from the service began being migrated to Skype last month. The move to amalgomate Lync too makes a lot of sense, and it comes amidst constant speculation that Yammer, its enterprise social network, its Office products and Skype will enjoy closer links in the near future. Despite coming under pressure from up-and-coming mobile messaging apps — such as WhatsApp — Skype continues to excel, and, according to Microsoft’s most recent figures, the service handles 2 billion minutes of connections each day. It, like other VoIP services, hasn’t been without controversy. Recently it was told by ARCEP, the French telecom authorities, that it could face criminal charges if it doesn’t submit to a law allowing French police to listen in on users’ calls.